A lot of work is done since 2012, the last time we have updated this site. We have stood up for Atheist, Bahai, Buddhist, Christians, Hindu, Muslims, Jain, Jewish, Sikh, Shinto, Native Americans, Wicca, and Zoroastrians. It will be updated this year in March. The US International Commission on International Religious Freedom (USCIRF) is holding a meeting tomorrow at the National Press Club about Persecution of Christians around the world. This agency does its work honestly and reports on just about every religious persecution around the world. It may come as a surprise to many, but it is a fact; on the list are India, Pakistan, China, Russia, Egypt and a few other countries. The ultimate religious freedom comes to each one if we stand up for people of other faiths including Atheists and LGBT community. Would you support me in making an effort to stop the persecution of Christians in this instance and all people in general? It requires you to take a stand or sign a petition if needed. I want my Hindu friends in particular to join the effort. If you are an Indian or a Hindu, you don't need to be embarrassed, it is not you and I, it is the radicals among us who are doing this. If we don't stand up, everyone will suffer at the end. The least we can do is loudly say that it is not Indians nor Hindus or Hinduism, it is the misled innocent men and women by the politicians and we will do our share to bring common sense to India, we will make an effort to see that every Indian lives his life freely and respects other persons right to believe, worship, wear, drink and eat whatever he or she wants. 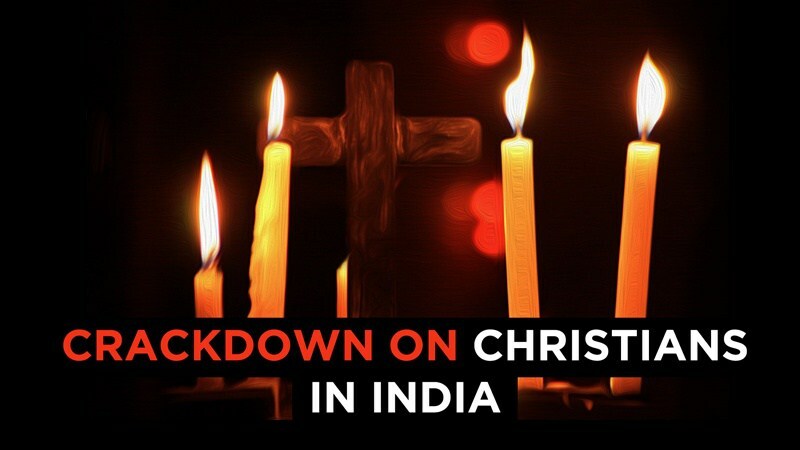 “As many as 410 incidents of attacks, harassment, and threats on Christians were reported in India in the first six months of 2017, the highest ever since the country’s independence, generally from or influenced by groups associated with the governing Hindu according to figures compiled by partners of Open Doors. Attackers are a nationalist party. The first quarter of 2017 saw 248 incidents of persecution, and by June-end, the number grew to 410, a report by Open Doors said, noting that a total of 441 incidents were reported in all of 2016. Apart from physical attacks, Open Doors’ partners recorded 37 incidents where Christians were socially boycotted and 34 incidents where Christians were forced to leave their homes. (Clearwisdom.net) It was shocking to learn that in a secret concentration camp in the Sujiatun District in Shenyang City, at least 6,000 Falun Gong practitioners are locked up. Their internal organs are harvested and sold for profit, and their murdered bodies are cremated to destroy the evidence. 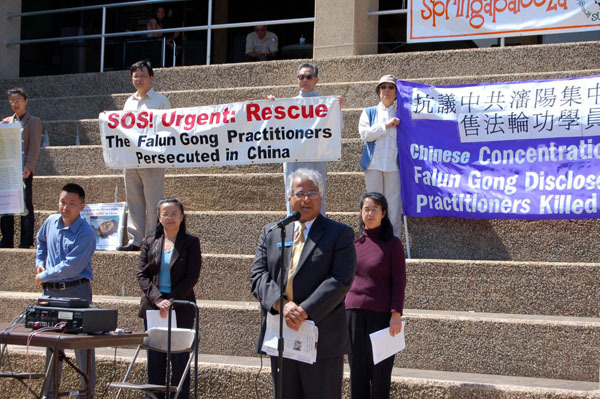 Practitioners in Dallas, Friends of Falun Gong at the University of Texas at Dallas (UTD) and a representative of a non-governmental organization held a press conference in front of the UTD Student Union at noon on March 16, 2006. They strongly condemned the Chinese Communist Party's (CCP's) atrocities and called on the international society to immediately investigate, stop the killing and rescue the practitioners being tortured and murdered for profit. In the press conference, Ms. Fu, President of the Friends of Falun Gong UTD, introduced the shocking inside story about the brutality at the Sujiatun Concentration Camp, and called on all UTD faculty and students to condemn the CCP's barbarity and help rescue those practitioners being persecuted in China. Ms. Zhang, a practitioner and information specialist, said in her speech, "Concentration camps for detaining Falun Gong practitioners were reported a few years ago. 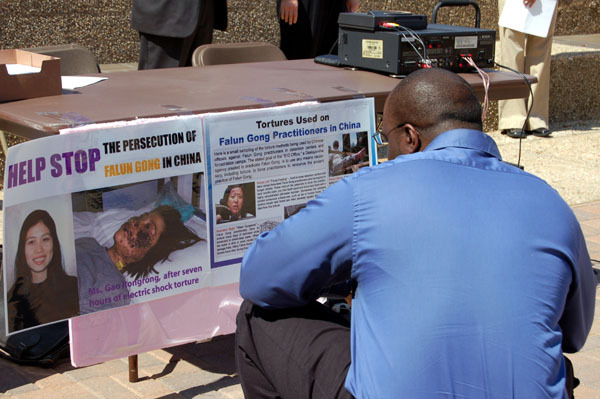 AFP reported on October 1, 2000 that two concentration camps were established to imprison Falun Gong practitioners. One was in Northwest and the other in Northeast. Each camp can imprison 50,000 people. Minghui.org (the Chinese version of Clearwisdom) reported on October 6, 2000 that a concentration camp was established in Xinjiang to imprison practitioners. Insiders disclosed that practitioners were taken to Xinjiang by train. But no further information was available because no one comes out of there." Practitioner and computer engineer Mr. Sun introduced Falun Gong and explained why Falun Gong is persecuted in China and why many people had not heard of Falun Gong after it began to be persecuted for nearly seven years. Mr. Sun said that even in China many people do not know that other people are persecuted because of personal belief. It is because of the information blockade in China. The CCP spent a huge amount of money to filter information over the Internet and demonize Falun Gong. The CCP breeds hatred towards those it does not like. 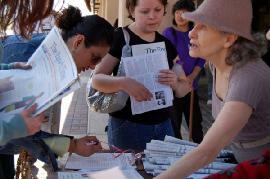 It also forces western countries and media to keep silent on the Falun Gong issue with economic enticement. Mr. Sun called on people to spread the facts to more people. Dr. Wu, a teacher in a local community college, said in her speech, "After the Nuremberg trials of Nazi war criminals, people hoped that concentration camps like Auschwitz and Buchenwald would never again appear in the future. Unfortunately, a similar concentration camp is running under the control of the CCP in China and the genocidal policy of Jiang Zemin, and the CCP is being applied to kill practitioners. In addition, the CCP is gaining a profit from the victims by harvesting their internal organs. This clearly exposes the CCP's evil nature. I call on the international community and human rights organizations to investigate the Sujiatun Concentration Camp. I urge all kind-hearted people to help end the CCP's killing of innocent people." Practitioner Ms. Hu said, "The CCP's persecution of Falun Gong has continued for nearly seven years. Such a brutal persecution is beyond normal people's imagination. More people should know about this. I call on the Chinese people stop being so numb, pay attention to the practitioners being tortured and help end the brutal persecution." Mr. Mike Ghouse, president of the Foundation for Pluralism, attended the press conference and gave a speech. 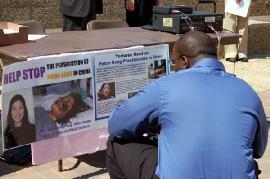 He said that he was shocked after hearing of the brutal persecution against Falun Gong practitioners. He expressed the concept that when an unfortunate incident occurs, for people with righteousness, they at least can speak out. If everyone keeps silent, when an unfortunate thing occurs to you, no one can speak for you. Mr. Ghouse called on people to be courageous and speak out for righteousness. At noon, many faculty members and students passed by the Student Union. They stopped to learn about the event when they saw the banners and posters for the press conference. When they saw the practitioners' exercise demonstration, they could not accept the fact that that CCP brutally persecutes such a peaceful practice. 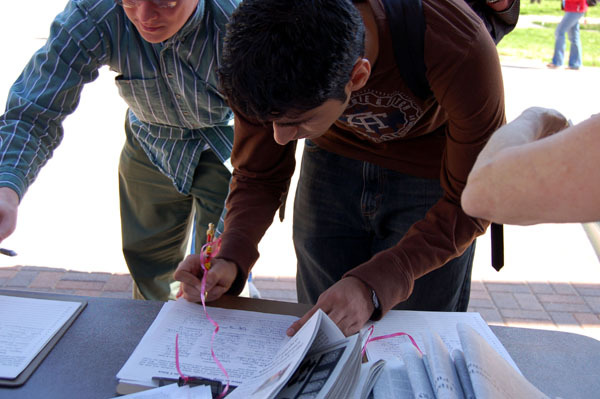 Many students signed a petition calling for a halt to the CCP's killing of innocent people. 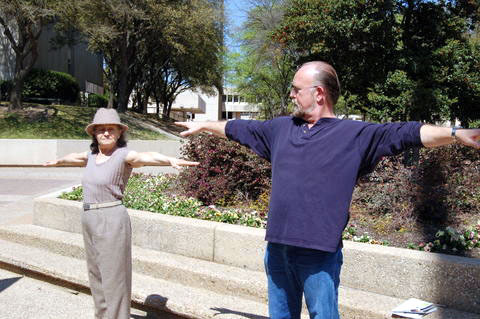 Some faculty and students expressed their interest in Falun Gong and started to learn the exercises on site. Practitioners in Dallas will hold a rally near the Richardson Chinatown to condemn the atrocities in the Sujiatun Concentration Camp, from 11:30 a.m. to 1:30 p.m. on March 18, 2006. Frequently, I am introduced in the following manner, "He is the first Muslim guy to commemorate Holocaust, and perhaps the first non-Jewish person to commemorate the Holocaust as well." Of all the people on the earth, my mother would be pleased to know that I am doing what it takes to be a "good Muslim," to respect, honor and protect the sanctity of life. As a Muslim committed to building cohesive societies, it was an honor to step up to the plate. Quran 3:133, "And vie with one another to attain to your Sustainer's forgiveness and to a paradise as vast as the heavens and the earth, which has been readied for the God-conscious." I am not driven by paradise, nor do I seek rewards. But it does mean building a cohesive world where no one has to live in apprehension or fear of the other. God-conscious simply means being caring and sensitive to all of God's creation; life and matter. Of all the people on the earth, my mother would be pleased to know I am doing what it takes to be a "good Muslim," to respect, honor and protect the sanctity of life. I have always believed, and I read the assessments of some of the best brains that if we can resolve the Jewish-Palestinian conflict, i.e., security to Jews and justice to the Palestinians, most of the world issues will collapse and a period of peace on earth will begin. Commemorating Holocaust and Genocides for seven years is a fulfillment of a lifelong desire. We beam all day long when we do a good thing; here is an opportunity for us to earn a cheer. The Native Americans and the American Indian Heritage Day Committee is asking you to consider supporting H.B. No.174, a bill to create the American Indian Heritage Day. With enough signatures from fellow Texans, it will make it easy for the state representatives to pass the bill, that will create an "American Heritage Day" to honor and appreciate the Native Americans. Every community, and every nation on the earth has a national day, except fellow Native Americans. We all have to participate and contribute towards each others pride. All you have to do is copy the following letter below or modify to suit your reflections, write your name, address and email to: roberto.alonzo@house.state.tx.us and copy to pslarney@gmail.com. You are welcome to copy me as well at MikeGhouse@gmail.com. Please accept this letter and my signature below as my strongest possible request that you lend your immediate support to passage of H.B. No. 174, a bill to create "American Indian Heritage Day" in the State of Texas. This bill deserves passage and will bring deserved recognition of the historic, cultural, and social contributions those American Indian communities and leaders have made to this state. We, the thousands of American Indian tribal members and friends of various tribes, have waited long to finally receive this deeply deserved respect and recognition from the State of Texas. With the passage of this bill, you have a unique opportunity and responsibility to celebrate the rich traditional and contemporary American Indian culture in this state. We hope you will realize that Texas ranks 4th in the nation in numbers of American Indians living in the state. Additionally, we urge you to take note of the presence of tribal members in Texas from over 120 different American Indian tribes, eight federally funded Indian Education Programs in the state, one Urban Inter-Tribal Center of Texas, and the American Indian Chamber of Commerce of Texas. Some writers have called our people "the invisible people" and certainly passage of H.B. 174 will help to create much needed awareness of our impact in the state. We thank you in advance for your help in passage of H.B. 174 in the Texas Legislature in the upcoming session. This is a proud moment for our people and we hope you will lend your support to officially celebrating this state's rich American Indian heritage and history. relating to creating American Indian Heritage Day. Sec. 662.056. AMERICAN INDIAN HERITAGE DAY. (a) The last Friday in September is American Indian Heritage Day in recognition of the historic, cultural, and social contributions American Indian communities and leaders have made to this state. (b) American Indian Heritage Day shall be regularly observed by appropriate ceremonies, activities, and programs in the public schools and other places to honor American Indians in this state and to celebrate the rich traditional and contemporary American Indian culture. It is inappropriate for Indian children and children of America to celebrate a day honoring a person for discovering a nation of people and not having a holiday paying tribute to the people of those nations. Therefore, the American Indian Heritage Day Core Committee is asking that you consider supporting H.B. No.174, a bill to be entitled an act relating to creating American Indian Heritage Day. Representative Robert R. Alonzo, D-Dallas, will be introducing H.B. No.174 to the Committee Reading of the 2013 Texas Legislature that could be as early as mid- to late February. We hope to receive at least two weeks notice so that we can announce the date and make preparation for appearance at the Committee Reading. We invite that you consider in presenting personal testimony to support H.B. No.174 either in person at Austin or have the testimony recorded in a journal to be presented to the Committee Reading. We expect to receive a very short notice to the day the Committee Reading will hear H.B. No.174. Again, submit the testimony to Representative Robert Alonzo's office for recording. Please send me a copy at pslarney@gmail.com ---- so that I may keep a log of possible presenters. We ask that you share this information with your families, friends, and community and ask them to submit a letter of support or a testimony. We need a Texas-wide support. Please contact your local elected officials and inform them of the upcoming H.B. No.174 and solicit their support. This site www.StandingUpforOthers.com is dedicated to Rev. Sun Myung Moon, whom I have come to respect and honor for his teachings in creating a cohesive world. Standing up for others is the right thing to do, every human goes through a period of invincibility to vulnerability, if we don't stand up for those who are vulnerable, then who will stand up for us when we are vulnerable? The idea of alms, charity, taking care of the elderly, weak, sick and the children is a common theme in every religious tradition. It is indeed an insurance for every one's well being. I cannot be at peace when others around me aren't, and hence it behooves me to take care of the ones who need assistance. I am blessed to have taken a stand for Jews, Catholics, Ahmadiyyas, Immigrants, Hindus, Falun Dafa, Zoroastrians, Muslims, Native Americans, Christians, Baha'i, Wicca, Sikh and other identities of humanity including GLBT community. It is the right thing to do. Father Moon emphasizes the idea, "Living for the sake of others" indeed there is a lot of wisdom in it as Martin Niemoller also reflects it in his eternal poem, "first they came for the Jews, I wasn't a Jew, so I did not say a thing, then they came for Communists, I didn't care, I wasn't a communist, then he concludes, then they came for me and it shattered me to know that there was no one left to speak up for me." Mahatma Gandhi has been a major inspiration in my life. Twice in my life I have seen Mahatma Gandhi in my dreams, the first time was when I was in College around 1971, when Mahatma Gandhi, the vice-chancellor of Bangalore University Sri V. Narsimaiah and I were having a dinner together and Mahatma puts his hands on my shoulders and says, "tujhe bahut kaam karna hai beta", you have a lot of work to do son, and again around 2003, he appears in my dreams and with the same affectionate hand (as my Dad's), he pats on my back, "you have to do it"... the only thing I consistently get from this message was the work of Pluralism, help me God, I am committed to do. Thanks to my Father and Mother for breaking away from the traditional practices of apartheid, growing up as kids, we did something that was un-heard of, the Dalits and us would eat off our plates, and drink tea off our glasses, they would come in to our home... and many had called my Dad for stopping it. I shall write that some time. Links are linked where the compilation is done, others will be completed by 12/31/12 - God willing if I am alive. Standing up for Bosnia - Faxes, phone calls etc. Reverend Moon's work for humanity is exemplary, he was committed to peace between North and South Korea, and Israel and Palestine. He was also considering enabling the United Nations to understand and resovle the religious conflicts before they exploded into genocides and massacres. His greatest legacy to mankind is the book he compiled called, "World Scripture" a comparative anthology of sacred texts. It is indeed the best reference guide for the pluralists and interfaithers. (A tribute to Rev. Moon). To be updated, God has blessed me to be a part of many a societies and I am thankful for the same. I urge you to knock off one hour's TV or gossip and spend that time standing up for others, the least you can do is to let them know that you are with them and that they are not alone. Please note the list of groups below with ** is to be updated and hope to update by March 2018. Dr. Mike Ghouse is blessed to have stood up for the rights of people of every faith from Atheists to Zoroastrians including Native Americans, Pagans, immigrants, Wicca and LGBTQ communities across the globe. He has a solid record of work for each one of these communities and a book is being written chronicling this work as an encouragement to people to enjoy the joys of standing up for others. 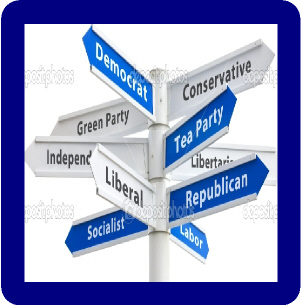 Mike is committed to building cohesive societies and offers pluralistic solutions on issues of the day. As we learn to respect the otherness of others and accept the God-given uniqueness of each one of us, he believes that conflicts will fade and solutions emerge. He has dedicated his life for this purpose and offers programs to bring about the positive change—to create cohesive societies. 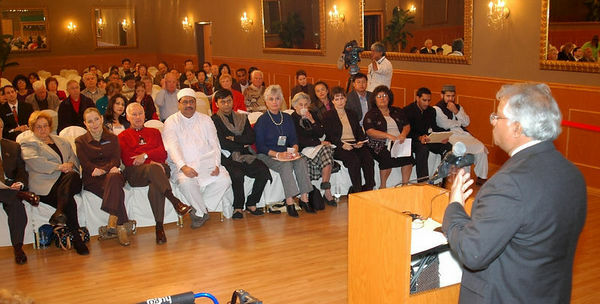 We are blessed to have taken a stand for the rights of fellow humans, including but not limited to Baha'i, Buddhist, Chrsitian, Falun Dafa, Hindu, Jain, Jew, Muslim, Native American, Pagan, Sikh, Unificationists, Wicca, Zoroastrian and every one in between religiously, but also Atheists, Immigrants, Gay and Lesbians and Civil Rights. Standing up for others is the right thing to do, every human goes through a period of invincibility to vulnerability, if we don't stand up for those who are vulnerable, then who will stand up for us when we are vulnerable? The work is done from a small protest to active protest and action, and we hop to compile and compose that by the end of June 2013 on this site.